Time and again, the government goes out of its way in advancing arguments in favour of the big licensees (UASL – Universal licensees) such as Swan and Unitech. Most Indians fail to understand why the government has to step in and bat for them. How would you justify the stake sale by Swan and Unitech soon after getting licence? As telecom minister, I have to ensure that the licences are issued in accordance with NTP99) and recommendations of TRAI. After issuance of licence, dilution of a company or offloading of shares is not in my domain. However, when there was a hue and cry that there was a windfall gain for some companies. After discussions, the then Finance Minister P Chidambaram clarified the position to the Prime Minister — in front of me. He said that it was not sale of equity by promoters. He said that valuations of companies reflected the “post money” invested in it, not just the value of licence or spectrum. Before we get into what “post money” is, lets lay out the basic facts. The two UASL winners Swan and Unitech did not have any assets nor significant liabilities other than the license. If nothing else, this makes working out their valuations much easier. To illustrate the point let us look at the Unitech-Telenor deal. It is reported that Telenor is paying Rs 6,120 crore for 60 per cent stake in the JV. What it means is that Telenor will be parting with 40 per cent ownership of this amount for gaining 60 per cent interest in the assets and liabilities of the company. Assuming that the JV company doesn’t have any other assets/liabilities other than licence, it means Telenor is paying Rs 2,448 crore (40 per cent of Rs 6,120) for 60 per cent ownership of telecom licence. This value of Rs 2,448 crore for 60 per cent ownership represents enterprise value of Rs 4,080 crore for the licence for which Unitech paid only Rs 1,650 crore. 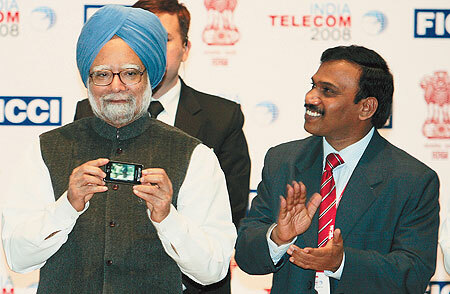 Does the erstwhile FM Mr Chidambaram’s defence of the windfall beneficiaries in front of the Prime Minister hold water ? Singh once again said Naxalism was the “biggest internal security problem” facing India. The Centre and state governments will have to take “all types of steps” to control the menace, he said. Corruption is a more fundamental problem than naxalism. The JV valuation is a bit bogus – it is from Unitech’s point of view, the price they were able to extract from Telenor for the licence. In other words, Telenor brought 6000 crores and Unitech brought the licence to the table and they got 60% and 40% share respectively. So, the argument goes, the license must be worth 4000 crores. However, an open auction might have fetched a higher price for the license – obviously Telenor does not intend to invest 6000 crores just to be able to recover the money. To see the real valuation, you have to check out the calculations and projections done by Telenor finance people. 1) The only thing related to telecom Unitech brought to the table was the license. So Telnor paid 6000 Cr for 60% of the license, they would have paid 10,000 Cr for 100% of the license. (Assuming we allowed > 74% foreign stake). So isn’t the value of the spectrum 10K Cr ? Is the valuation of the JV useful ? What is this ‘post money’ the FM is talking about ? A bit long winded – but I think this needs to be cleared up. I believe the Government is trying to create a smokescreen and the purpose of the author of the article is possibly the same. There are several ways the deal could be structured. Let’s say I have the license and you want to play. (A) I sell you the license outright for 6000 crores. Post deal – I just own the cash, the entire cash, you get the entire license. At this point, the company now consists of ONLY the license and entirely owned by you. The price of the license is indisputably 6000 crores. (B) We make a JV. You invest 6000 crores, I just invest the license. So now, the company equals 6000 crores in cash + license. So, under the second structure, the license truly gets valued at 4000 crores. However, first of all it does not diminish the problem – we are saying instead of a 10,000 crore scam, we have a 4000 crore scam. How does the Harvard educated gentleman figure this is any less serious? Second of all, this is the most important point: the 4000 crores is just the internal evaluation. Open auction could potentially fetch more. To get a true estimate of the license value, one has to wait till the company’s shares hits the stock market. In a way, the JV effectively becomes a money laundering device in this case.